I immediately clicked on the “Not secure” label preceding the offending URL to examine the digital certificate in more detail to see if I could figure where the error was. I’ve been doing public key infrastructure (PKI) and digital certificates for over 20 years. I like to figure out the errors myself, to see who made what goof. 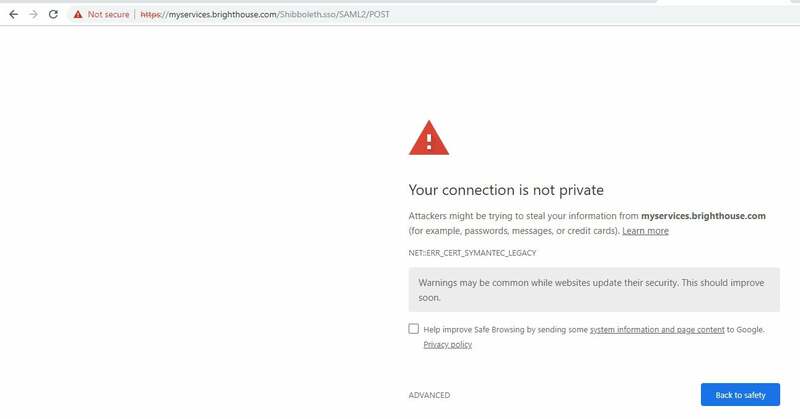 Google’s own research has shown that the more a person knows about PKI and digital certificates, the more likely they are to ignore digital certificate errors and proceed to websites with digital certificate errors (which could be a bad move). 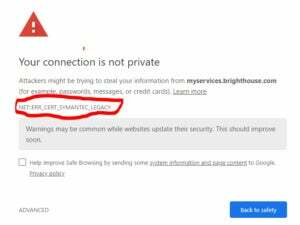 For a few years this led to Google and Microsoft both providing less digital certificate information when a digital certificate error was encountered. Luckily, both companies seem to have reversed course and will let us digital certificate nerds do more detailed inspection when we feel motivated to do so. In a nutshell, I could find no errors or mistakes — at least none readily identifiable. It was using SHA256 (not SHA1). It had a 2048-bit RSA key (not 1024-bits). 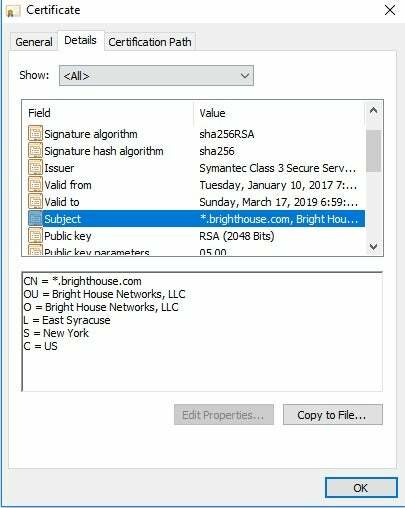 The subject, *.brighthouse.com, was correct for the website page I was viewing, and also re-entered under the subject alternative name (SAN) field. Most of the certificate errors I see are made in the subject or SAN fields, as they are linked to the URL domain name, but I couldn’t find any easy-to-identify errors. It perplexed me. This was a pretty big deal in the computer security world last year. I expected the phrase, “Them’s fighting words,” to be said before revolvers were pulled. 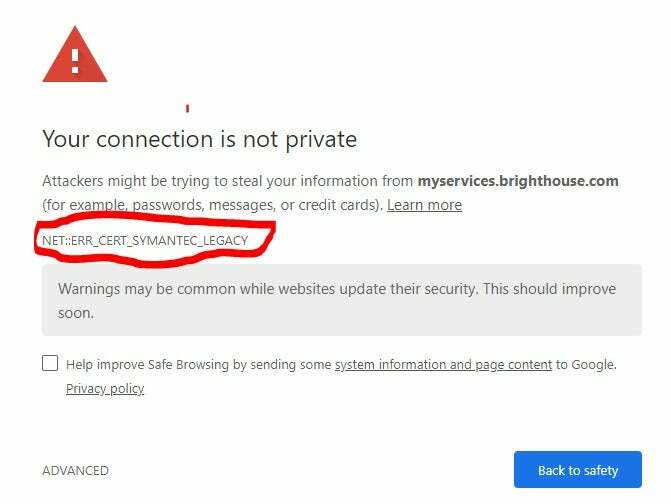 Ultimately, Google decided that they could no longer trust Symantec or any digital certificate Symantec issues, and they were going to, among many other actions, invalidate all Symantec-issued certificates very soon. This panicked much of the world because tens of millions, if not hundreds of millions, of public certs issued under the Symantec PKI arms would be involved. Google’s move could cause millions of otherwise trusted and beloved websites to start erroring out. Although I and many others think this part of Google’s solution was ham-fisted, I respect Google’s right to determine the safety of its own products and in erring on the side of safety. I do wish the error message was a bit more informative. It would have been great if the messaging was a little less “hackers are attacking you” and more of “The company you are connecting to is using an invalid digital certificate, click here for more details.” Not sure why warning messages provide so little useful information to the casual viewer. Perhaps that’s why my initial reaction was to gloss over the warning message and to start looking for the details on my own.